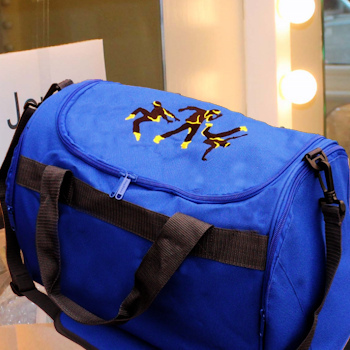 Royal Blue premium quality holdall bag with bespoke embroidered dance design on the top opening and can be personalised with a name or initials. Bespoke embroidered hip hop dancers silhouette sewn in black with bright coloured accents and a single name, nickname or initials underneath. To have a personalised name added enter it in the text box provided and tell us the text thread colour you want it sewn in. The accents on the motif will be sewn to match.